New York Rangers President and General Manager Glen Sather announced today that the club has agreed to terms with forward Dane Byers on a contract extension. Byers, 24, skated in five games with the Rangers this season, registering one goal and 31 penalty minutes. He notched his first career NHL goal in his season debut on October 30 at Minnesota. Left wing Dane Byers had a breakout season for the Hartford Wolf Pack in 2009-10, scoring a career-high 25 goals and 52 points. 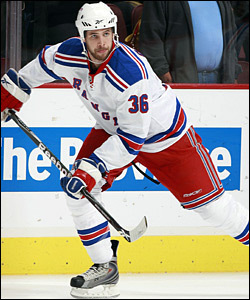 He also notched his first NHL goal during a five-game stint with the Rangers. Byers spent most of the season with the Hartford Wolf Pack of the American Hockey League (AHL), recording 25 goals and 27 assists for 52 points, along with 100 penalty minutes in 74 games. He established career-highs in goals, points and power play goals (13). He ranked second on the team in points and power play goals, third in goals and fourth in assists. His 13 power play goals also tied for seventh in the AHL. Byers posted 12 multi-point performances, including two, three-point efforts on February 13 vs. Bridgeport (two goals and one assist) and April 10 vs. Springfield (one goal and two assists). He also registered a career-high, seven-game point streak from October 23 at Adirondack to November 19 vs. Wilkes-Barre Scranton, tallying nine points (four goals and five assists) over the span. In 2008-09, Byers recorded four goals and three assists for seven points, along with 18 penalty minutes in nine games with Hartford (AHL). He registered six points (three goals and three assists) in a five-game span from October 22 at Worcester to October 31 vs. Worcester, before missing the last 71 games of the regular season to injury. Byers returned to the lineup for the playoffs, and finished tied for the team lead in goals (three) and second in points (four) in six games. His three goals and four points both established playoff career-highs. The 6-3, 204-pounder has skated in 239 career AHL games over five seasons with Hartford (AHL), registering 69 goals and 85 assists for 154 points, along with 521 penalty minutes. He established a career-high in plus/minus rating (plus-23) during the 2007-08 season, and made his NHL debut with the Rangers that season vs. Los Angeles on February 5, 2008. In 2006-07, he set career-highs in games played (78), assists (30) and penalty minutes (213). His 30 assists ranked second on the Wolf Pack, while his 213 penalty minutes finished third on the team. Byers notched his first career AHL hat trick on March 31, 2007 vs. Manchester. As an AHL rookie in 2005-06, he collected an assist in his professional debut on April 7, 2006 vs. Portland. The Nipawin, Saskatchewan native was originally the Rangers’ second round selection, 48th overall, in the 2004 NHL Entry Draft.